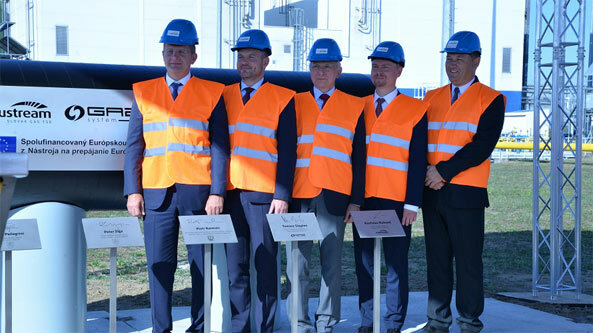 On 18 September 2018, an official ceremony, held in town of Velké Kapušany, kicked off construction works on the Slovak section of the cross-border gas pipeline, that is meant to connect gas transmission systems of Poland and Slovakia. The event was attended by Peter Pellegrini, Prime Minister of the Slovak Republic, Peter Žiga, Minister of Economy of the Slovak Republic, Piotr Naimski, Government Representative for Strategic Energy Infrastructure, Rastislav Nukovic, General Director at Eustream, and Tomasz Stepien, CEO of GAZ-SYSTEM. The said interconnector is going to link the gas compressor station, based in the Slovak town of Velké Kapušany with the gas hub, located in the town of Strachocina, Poland. The project has been jointly implemented by GAZ-SYSTEM and EUSTREAM, the Slovak company. “Performance of the investment is considered a crucial element of the GAZ-SYSTEM investment strategy. We have been implementing a complex diversification programme, that is supposed to enable Poland to vary routes and directions of gas deliveries. In addition, our goal is to integrate markets, so that the suppliers and recipients operating within this particular region could have an access to various gas sources.” Underlined Tomasz Stepien, CEO of GAZ-SYSTEM. Moreover, Mr. Tomasz Stepien emphasised that the construction of the interconnector tying Poland and Slovakia complements a top-priority EU infrastructural concept, i.e. execution of the North-South Corridor. “Owing to this implementation, the states of the region will be granted an access to new gas delivery sources from the northern direction, such as e.g. 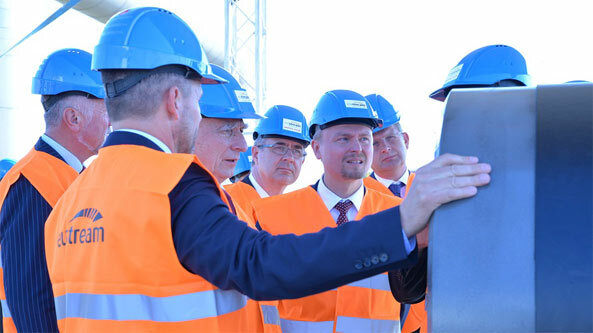 LNG Terminal in Swinoujscie or Baltic Pipe” he said. “It will contribute to establishing secure and competitive gas market in the region of Central and Eastern Europe and across the entire European Union” he added. Furthermore, Mr. Piotr Naimski, Government Representative for Strategic Energy Infrastructure, stressed high importance of the gas connection between Poland and Slovakia for building of an independent and competitive gas market within the region. “I am glad that our Slovak partners recognise how significant the diversification of gas sources of this material is to security and economic development of our region. I am convinced that this investment will translate into tangible benefits both for Poland and Slovakia” he pointed out. Rastislav Nukovic, Head of Eustream, emphasised that building of the Polish-Slovak gas interconnection is an example of an excellent co-operation between these two countries and the companies as well. “The interconnector that is under construction creates new gas trading opportunities, that are going to be advantageous to CEE countries. I would like to express my thanks to our business partners and all involved parties for their commitment in performance of this crucial European PCI investment” he declared. The planned interconnector will bind gas transmission systems of both states: the Slovak gas compressor station, based in the town of Velké Kapušany with the gas hub, located in Strachocina (Podkarpackie Province). The project of Poland-Slovakia gas connection also covers an indispensable extension of an internal transmission network in south-eastern Poland, construction of the gas compressor station in Strachocina and establishing of the metering station nearby the Polish-Slovak border. The total length of the connection is 165 km. The commencement construction works is scheduled for mid 2019. The into-Poland and into-Slovakia capacities amount to 5.7 billion m3/annually and 4.7 billion m3/annually, respectively. Binding of the Slovak and Polish gas transmission systems have been recognised in the list of PCI projects approved by the European Commission in November 2017 within the North-South Gas Interconnections in Central Eastern and South Eastern Europe priority corridor (NSI East Gas). It has been the third time of granting the PCI status, as in the past, the project had been mentioned both in the first and the second PCI Lists, approved back in 2013 and 2015, respectively. The significance of the Poland-Slovakia project for development of the gas market within the EU has been also reflected in the EU subsidies provided within TEN-E (Trans-European Energy Networks) and CEF (Connecting Europe Facility) programmes. The grants encompassed analytic, design and construction works, to be performed in the territory of Poland and Slovakia. Top priority co-financing agreements related to this project were signed by GAZ-SYSTEM and Eustream and Innovation and Networks Executive Agency (INEA) in 2015 (design works) and 2017 (construction works).